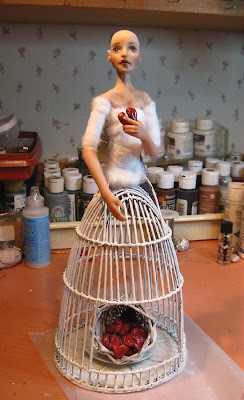 The Art Dolls Only Group (ADO) Broken Heart Challenge ends today...and I WILL be done! Yes, I left this to the last minute *sigh* and am now in the process of costuming and wigging my "Guardian of Broken Hearts". The above pic is the state she was in on Saturday. This is the first cage type doll I have done. I've had a vintage bird cage on my shelf for several years, wanting to do something with it and this piece was the perfect application (with slight modifications). Will post pics of her completed later today. What a gorgeous cage doll!!!! She looks like the antique ones!!! Gorgeous Sue. I can't wait to see her finished!!!! She's very lovely, and melancholy, too. Sue! she is lovely! I am so excited to see her finished! Gosh, thanks everyone! This challenge was a lot of fun, I just have to learn to time myself better. was a bit of a wasted month, and bam...I was out of time. I did get her finished, however I'm tired and will post pics tomorrow. Zan...that is a doozy and my brain is mush. Wow! She's fantastic already. I can't wait to see the finished piece! Oh, I love her! I can't wait to see her! Fabulous rendition of a broken heart. I love your work! I'm in love! She's beautiful!